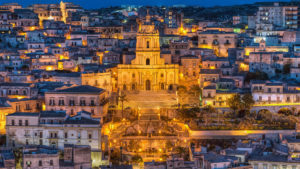 Typical of so many Sicilian towns, Modica has a long and varied history, complete with the usually toing and froing of successions of invaders. It came to real prominence in 1296, when Frederick II of Aragon (not to be confused with Frederick II “Stupor Mundi”) formed the “County of Modica”, a kind of “state within a state” that was initially governed by Mandfredi I Chiaramonte. Just out of town, the beach at Marina di Modica is absolutely splendid and relatively quiet outside August.